A brief and unusual flash spotted on June 16, 2018 has puzzled astronomers and astrophysicists across the globe. The event, called AT2018cow and nicknamed “the Cow,” defies many of the models scientists use to explain similar outbursts, prompting multiple hypotheses about its source. Amy Lien, an assistant research scientist in UMBC’s Center for Space Sciences Technology, is on a team of researchers working with NASA’s Neil Gehrels Swift Observatory to develop one theory about the blast’s source. Their model describes a monster black hole shredding a passing star. The Cow occurred in the vicinity of a star-forming galaxy known as CGCG 137-068, located in the constellation Hercules, about 200 million light-years away. That’s 2,000 times the distance from one edge of the Milky Way galaxy to the other. The Cow was first observed by a ground-based telescope in Hawaii, and the initial observations interpreted it as a potential supernova. Astronomers are quite interested in supernovae, so other telescopes around the world were quickly pointed in its direction to learn more. All three instruments on the Swift Observatory observed the patch of sky where the Cow was spotted for at least 60 days after the initial sighting. Lien and four other research teams shared their groups’ different interpretations during a panel discussion on January 10 at the American Astronomical Society (AAS) meeting in Seattle. The mysterious “cow” explosion appears in the center, as viewed from the NASA Swift Observatory. 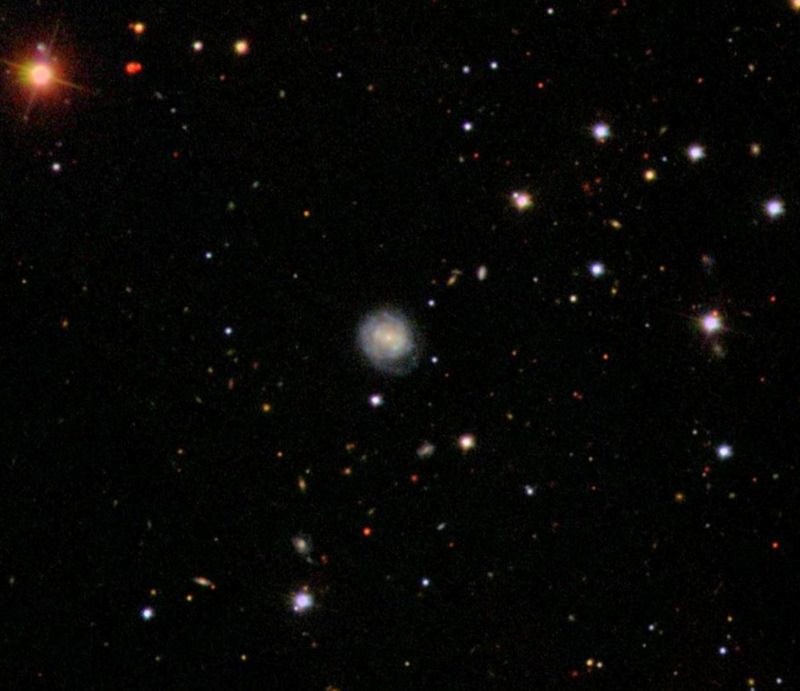 Image provided by the Sloan Digital Sky Survey. The explanation Lien’s team settled on is an event called a tidal disruption. “When a star gets too close to a black hole, it will get stretched and torn apart by the tidal force in a similar way that causes tides on Earth,” explains Lien. However, because the black hole has an extremely strong gravitational force, instead of just an ebbing tide, “you see the whole star get stretched and shredded,” she says. Lien and her colleagues think the shredded star was a white dwarf: a hot, roughly Earth-sized object that represents the final state of stars like our Sun. They also calculated that the black hole’s mass ranges from 100,000 to a million times the Sun’s. It’s unusual to see black holes of this scale outside the center of a galaxy, but it’s possible the Cow occurred in a nearby satellite galaxy or a globular star cluster, which tend to contain a higher proportion of white dwarfs than average galaxies. When the star was torn apart, the Swift team theorizes, its debris formed a hot, opaque sphere as it was sucked into the black hole. Because the sphere is so dense, it expands very quickly (at nearly 10 percent the speed of light) and creates a “cocoon” layer around itself, which then flies away at extremely high speed. The whole process of tearing, compacting, and flying away “generates a lot of energy,” says Lien, “and some of it is released as light, almost like a huge light bulb.” That could explain the light coming from the Cow. Swift, which orbits Earth about 340 miles above the surface, observed the Cow with all three of its instruments, which detect UV rays, x-rays, and gamma rays. Data from these instruments helped the scientists determine the temperature of the Cow, which is approximately four times the temperature of the Sun and consistent with a tidal disruption. The rate at which the Cow’s brightness decreased during the observation period and its extremely high temperature added to the team’s convictions. But there are still elements that are less likely based on their hypothesis. A paper on the Swift findings, which Lien co-authored and presented at the AAS discussion, has been accepted by the Monthly Notices of the Royal Astronomical Society.